GRAND RAPIDS, MICH. - It's that time of year again when sportsmen and sportswomen in West Michigan step up and make a difference for those less fortunate in the community. The Annual Tony Gates/Michigan Sportsmen Against Hunger Food will be Thursday, March 19, during opening day of the Ultimate Sport Show, at DeVos Place in downtown Grand Rapids. Bring six boxes or cans (4 pounds minimum) of non-perishable food items to DeVos Place on Thursday and receive a pass for free admission to the Show that day only - a $10 value for adults. Volunteers from area sportsmen's clubs will collect the donations for the food drive and donate it to God's Kitchen and other West Michigan distribution centers for people in need. The annual drive, spear-headed by the popular WLAV-FM morning show host, brings in several tons of food each year from thousands of donors. Beginning at 6 a.m., Gates will broadcast all day from an RV at 303 Monroe Street NW in front of DeVos Place in downtown Grand Rapids. Some donors, in a hurry to get to work, can drop off sacks of food but don't have time to accept the free pass to the show. 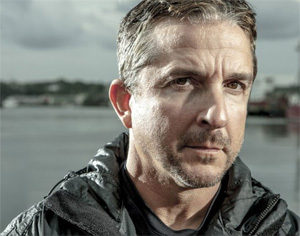 "Dave Carraro, from National Geographic's hit show Wicked Tuna, is one of our featured speakers at the show this year. We want to show Dave how much we like tuna here in West Michigan so we're asking patrons to include tuna, a very good source of protein, in their donations to the food drive," said Show Manager Ben Neilsen. "The generosity of sportsmen and sportswomen from the area make this one of Michigan's largest single-day food drives. We're happy to be able to host it again this year and we're delighted that Tony Gates will once again lead the charge."